February 11 is National Peppermint Patty Day. It's a good reason to taste a great combo of chocolate and peppermint again. First peppermint patties appeared in York, Pennsylvania. 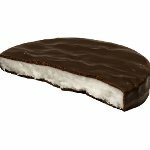 The York Cone Company, which originally produced ice cream cones, launched the York Peppermint Patty in 1940. These candies were very popular, although they were sold only in the Northeastern United States, Florida, Ohio and Indiana. The York Peppermint Patty was launched nationally only in 1975, after the company had been bought by Peter Paul. There were other patties on the market, but York's were special. They had hard and crispy sweet filling, covered with bitter chocolate, while the competition was soft. Peppermint patties gained notoriety after the debut of famous Charles Schultz's comic strip Peanuts in 1966. One of the characters of the comic strip was Peppermint Patty, whose actual name was Patricia Reichardt. Did you know that peppermint patties are the less caloric and fat compared to other popular candy bars?